It was so nice to be able to find all the fabrics to make a quilt featured in .... I shopped locally , and on several online stores. Some of the on line stores had a few each, and I was so delighted to find every fabric I needed at Quilt Home! I don't get to quilt a whole lot, but I really enjoy it, and from this point on I will start my search with you. Thank you! Fat Quarter Bundle QuiltHome style! Our angels have done it again! This product is our own take on the fat quarter bundle...whether stash building, quilting, or an extra special gift to give to a friend, this bundle is beautifully packaged just for you! 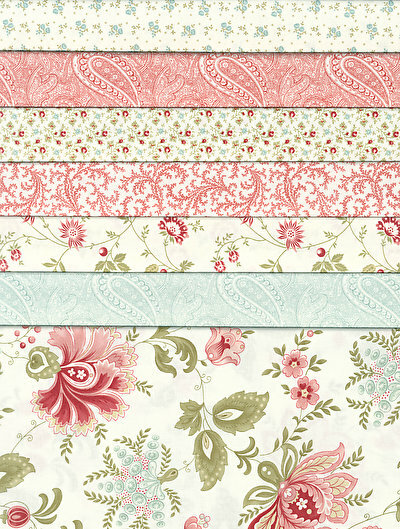 This Porcelain Fat Quarter gift pack includes 7 fat quarters in the Mist palette from 3 Sisters&apos; Porcelain collection.